Despite a 30-year lifespan that gives ample time for cells to grow cancerous, a small rodent species called a naked mole rat has never been found with tumors of any kind�and now biologists at the University of Rochester think they know why. 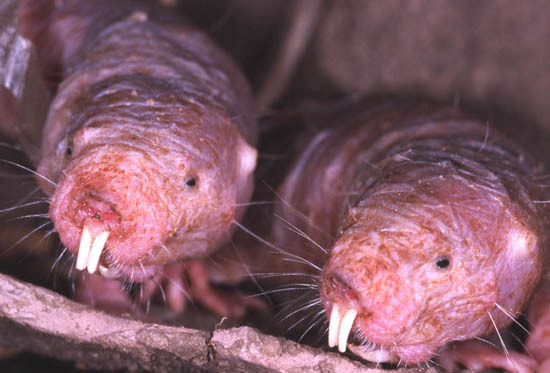 "We think we've found the reason these mole rats don't get cancer, and it's a bit of a surprise," says Vera Gorbunova, associate professor of biology at the University of Rochester and lead investigator on the discovery. "It's very early to speculate about the implications, but if the effect of p16 can be simulated in humans we might have a way to halt cancer before it starts." Over the last three years, Gorbunova and Andrei Seluanov, research professor of biology at the University of Rochester, have worked an unusual angle on the quest to understand cancer: Investigating rodents from across the globe to get an idea of the similarities and differences of how varied but closely related species deal with cancer. In 2006, Gorbunova discovered that telomerase�an enzyme that can lengthen the lives of cells, but can also increase the rate of cancer�is highly active in small rodents, but not in large ones. This research was funded by the National Institutes of Health and the Ellison Medical Foundation.